"As I Walk Through the Alley of the Shadow of Ramps"
At this point it’s fairly well-known that no one should get on Louise’s bad side. So when “As I Walk Through the Alley of the Shadow Ramps” starts out with a new neighbor pushing her buttons and threatening her reputation by calling her “tricycle girl,” it’s a given that things are about to get ugly. What’s surprising here is that things get much more ugly for Louise than they do for her latest nemesis Alice, the owner of the When Hairy Met Smoothie hair waxing and smoothie truck. Louise is the only Belcher who doesn’t allow herself to be vulnerable. 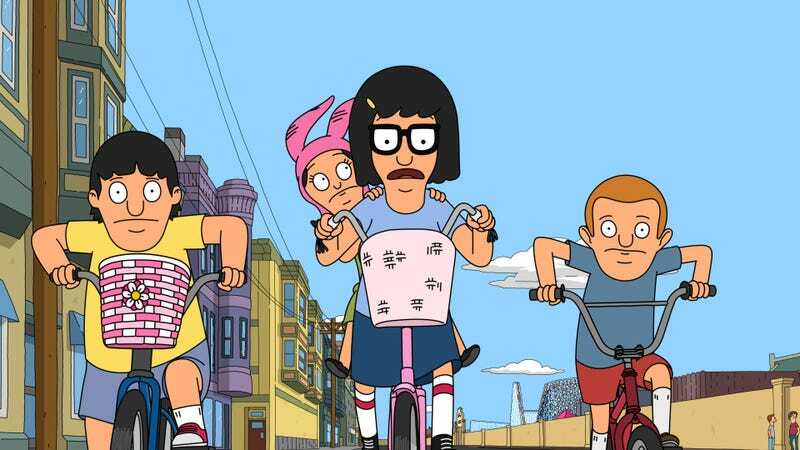 Linda, Tina, and Gene almost embrace moments where they can emotionally open up and be dramatic, and Bob, well, he cries several times in this episode thinking about his kids riding a bike. In this case especially, Louise sees vulnerability or fear of learning to ride a two-wheeler as a weakness, and anyone who brings attention to that weakness needs to be shown who’s boss. While Louise is gathering the Wagstaff kids to help her send a message to Alice, Linda is trying to keep Gayle (Megan Mullally) from quitting her job. It’s always a joy to see Gayle’s latest obsessions, and putting her in an art gallery where she may or may not need to hold a potential art thief hostage in the staff bathroom is the update on her life we needed. The only downside to her appearance here is how brief it was. Here’s hoping we catch up on her relationship with the man who called his cat his wife sometime soon, because they really do seem perfect for each other. 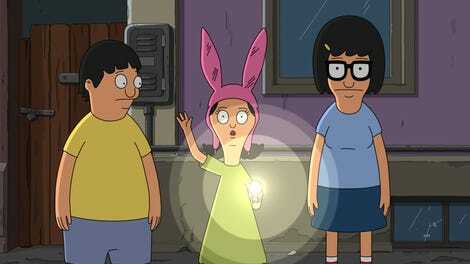 Bob’s Burgers usually has a way of helping its characters face their fears and overcome obstacles without getting too schmaltzy, but this week’s speech from Tina and pre-bicycle moment with the Belcher family gets very close to crossing that line. The moment is saved in a truly beautiful sequence of Bob not yet letting go of Louise’s hands on the bicycle while the two sing a lovely rendition of “Bat Out of Hell.” By the end of the sequence we’re not sure if Louise actually took off on that bike or if a reincarnation of her green tricycle will appear in a future episode, and that uncertainty redeems any unwanted after-school-special vibes. Speaking of beautiful sequences, one stand-out of this season has been an evolution in the animation. Sure, not much can or should change to maintain the spirit of the show, but small details aren’t going unnoticed. Particularly tonight a scene when a plastic bag flew behind Louise in the alley and regular-sized Rudy’s slo-mo ramp jump (“God saw.”) stood out as moments of artistry that make this show stand-out. With the news that it’s survived the bloodbath at Fox and will be here for another season, it will be interesting to see how much more they can do. The review of tonight’s second new episode, “Mo Mommy Mo Problems,” will be up early tomorrow!